Stay in the game with the Adidas ACE Club shinguards. Protecting your legs is important, as dings and bruises can set your game off. This lightweight shinguard is perfect for players of all ages. The dual straps for the shinguards make it so sleeves are not needed. Get your Adidas shinguards today and protect your legs. Check out our entire collection of Soccer Shinguards. 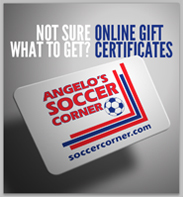 soccercorner.com is your 'One Stop Soccer Shop' to fill all your soccer needs.